A young woman and her son were displaced by an early morning fire at the Willow Creek Mobile Home Park. 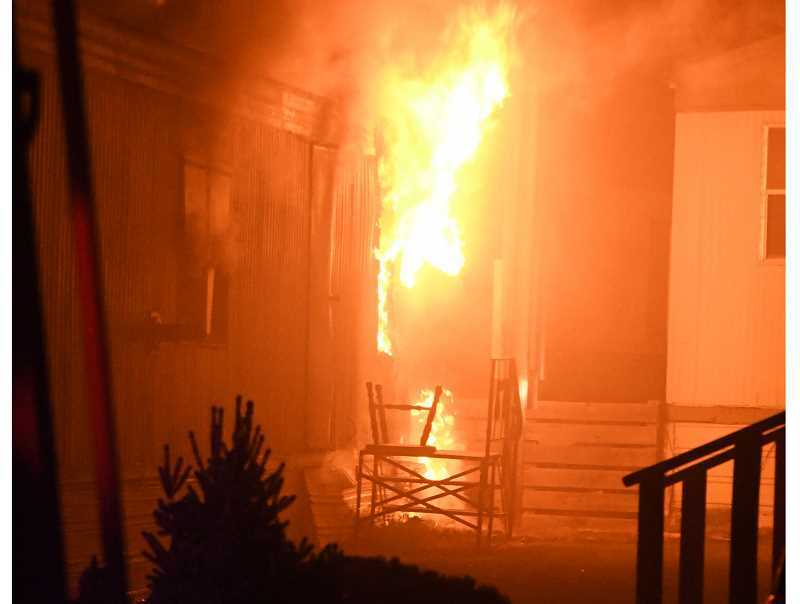 A fire, which broke out in the middle of the night Sept. 30, in the Willow Creek Mobile Home Park on Northwest B Street, burned a mobile home, displacing two residents. "We received a call at 3:18 a.m.," said Lt. Kirk Hagman, of the Jefferson County Fire Department. "Upon arrival, it was approximately 30 percent involved." The fire started in the master bedroom, at the rear of the trailer, occupied by a 24-year-old woman, who owned the trailer. "They had a smoke detector; she woke up, got the child, got out and made the phone call — everything she was supposed to do," said Hagman, who was one of four career and nine volunteer firefighters responding to the blaze. "The fire was contained by the first arriving units," he said. "We had two exposures and one propane tank we were attending to." The other trailers, which were about 15-20 feet apart, were initially threatened by the flames, but the firefighters were able to knock them down. Nearby units were evacuated by the Jefferson County Sheriff's Office, while Jefferson County Emergency Medical Services was on hand in case of medical needs. However, no one was injured. "Some went to their neighbors' and she went to her uncle's," said Hagman, adding that the neighbors were able to return to their homes within an hour to an hour and a half after the first report.